I positively LOVE this washer. Once I learned to not overload it it works perfectly and my clothes, bedding, towels, etc, come out perfectly clean. I only use pods as detergent so I can not comment on liquid or powder detergents, but the pods work great. I like that it tells you when it needs to go through a cleaning cycle and all it takes is a cup of bleach to do it, and I really really like the timer setting. 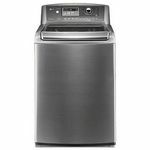 My only semi negative comment is that the cycles are super long, but it it not anything that deters how much I love this washer! Very disappointed with this supposedly high end model. After less than 5 years the bearings in the tub are gone. Maytag/Whirlpool 10yr parts warrantee won't cover defective parts and will cost $500 to repair. Don't pay the price for high-end Maytag/Whirlpool. They are not quality and the company doesn't stand behind defective parts. Should a high-end Maytag washer really last less than 5 years???? Mines has made a warping noise ever since i got the product. I am 5' 2" and i can not get the laundry out, i have to literally climb on top to get my laundry. When i bought this product i did not realize that it was much taller than my washer i already had. After years of owning Maytag front loading machines (that we loved, although washer was a little small) --- we decided to go for a top loading machine because we love our older top loader at our other house. WHAT A PIECE OF JUNK! 1. it is noisy. 2. it does not clean worth a bean and 3 half the time we can't get all the digital turn off/on settings to work. I put my dog blanket and pad through THREE times each time trying a more heavy setting, or more water or more rinse -- and it came out just as dirty after the third time as the first time. I have only owned this for 6 months, so a real shame I will have to replace so soon, but I cannot live with this machine any longer. Maytag used to mean 'quality', now it is just plain junk. Bought the washer a few weeks ago. Very excited to get a new washer, although very expensive. Judd & Black told us that this was the best washer. After a couple of weeks, my wife and I have found this washer does not wash clothes, still trying to figure out what it does. You put in dirty clothes and you get dirty clothes back. My grandmother's wash board did a better job than this. Our old Kenmore washer did a much better job. Don't know why but but clothes come out still dirty. we follow the instructions put the soap in using Tide he and still poor cleaning....I would not recommend this washer to anybody, in the process of trying to return it. I have owned both the washer and dryer for about 4 years. I decided to write this review to warn consumers not to buy it. The problem with this machine is that it tangles my clothes up into a huge knot then everything lands up on one side of the machine causing the machine to lose balance. The machine clatters and bangs against the dryer at which point i have to run to my laundry room stop the machine and untangle my clothes. If i dont get ther quick enough my clothes don't get rinsed right. I go through this process at least twice during the same wash cycle. I can never leave the house while doing a load. I hat this machine. We've owned the Bravos XL for over a year. It handles large loads easily if you follow the loading instructions. 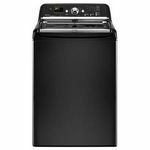 It cleans the clothes very well and uses significantly less water and detergent. If you have heavy bulky items it is prone to get out of balance. Heavy fleece blankets or comforters have been a challenge but once you get it balanced it will clean it like a champ! It is noisier than our old standard washer. As it goes into spin mode it sounds like a jet engine starting up. The cycles take longer than a standard washer but that hasn't been an issue for us. If you use the scented softner beads you have to be careful to not use too many in cooler washes or you may get residue on your clothing. It has been very reliable and easy to use. The controls are very simple and give you many options. I really enjoy my Maytag Bravos XL HE washer. 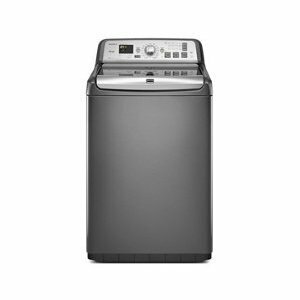 An HE washer works differently than a conventional washer, and it takes a little getting used to, but it saves a lot of water. I had read other reviews that said it ties the clothes in knots, but if you load it correctly it won't do that. You can't load an HE washer like you do a conventional washer. In a conventional washer you have to arrange the clothes around the agitator. An HE washer doesn't have a conventional agitator, it just has a slight hump in the middle of the washer drum. You literally have to heap each item of clothing in the washer drum, leaving the middle hump in the drum visible as you go. If you heap the clothes instead of laying them around the middle the clothes won't get tied in knots. If you put it on the highest setting for the spin cycle, the clothes will be practically dry when they come out, but the wrinkles will be hard to get out, so I don't use the highest spin cycle except maybe for towels. I would add that if you are using bleach, just put a small amount in the bleach receptacle and add water to bring it to the line. The only thing I don't like about this washer is that you are not supposed to use color safe bleach. It takes chlorine bleach only. When it spins, it does sound a bit like a jet taking off, but it's not overly loud. To us, it just demonstrates the efficiency and power of this model. We are actually amused by it. Overall, once you get used to how an HE washer works, you'll love the fact that it saves a lot of water and gets your clothes cleaner than a traditional washer. Energy Efficiency I can wash a lot more clothes per load, so fewer loads means using less electricity. Cleaning Time There are many ways to tailor your loads and cleaning times. 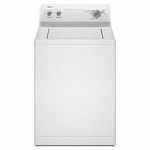 It may take a little experimentation to find which combinations work for you, but once you do get used to it, this washer is very superior to a conventional washing machine. Performance I do feel this washer gets clothes cleaner than conventional machines. 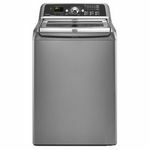 Ease of Use It doesn't seem easy at first, but once you get used to it, you'll never go back to a conventional washer! Design Love the large load capacity! Durability We've only had ours for about 7 months, but we've had no problems. Great Bravos Washer, except it is way too loud! 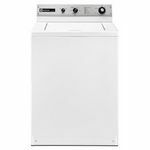 This washer does an excellent job of getting our clothes nice and clean, and is very energy efficient also. I also like the extra large tub size and the top loading feature. But it literally sounds like it is about to take off and fly away when it is in the spin cycle. No amount of balancing or tightening of parts has helped fix this issue and it drives me crazy. Other than that, it is the best washer I have had for getting things clean. Energy Efficiency This washing machine uses very little water and really washes quite well on the cold wash and cold rinse cycle. Cleaning Time Very clean for the short amount of time it takes. There are many different cycles to pick from too, depending on dirt level of clothes. Performance This washer is way too loud in the spin cycle, but washes clothes quite well. Ease of Use The top load ability is so much easier than a front loader. Durability It has held up well for over two years, other than the noise level.